Get TNPSC Village Administrative Officer Notification 2019 pdf: Tamil Nadu Public Service Commission, also known as TNPSC, has disclosed the TNPSC VAO Recruitment all the way through its Official Website for allowing the interested candidates to apply against the TNPSC VAO Notification 2019. The concentrating applicants can fill the applications using the Main Website before the last date. Taking account of the notification released by Tamilnadu Public Service Commission, we get to know that there are several vacant positions of Village Administrative Officer been made available which need to be filled by those aspirants who are considered qualified in the VAO Exam. We suggest all the interested candidates get the best of the TNPSC VAO Recruitment Notification with the help of the Official Website (get the Official Website’s address from the bottom of this page). The applicants need to know that the application mode is completely online, no other way of submitting the applications will not be entertained. Other crucial information in this concern is well furnished in the following section. We, for the better convenience of our valuable applied candidates, are presenting the requisite eligibility criteria so that the contenders who are interested in applying for these Village Administrative Officer Posts do not have to confront any difficulty. Take a look at the below-provided eligibility criteria and apply as according to it. The age of the SCs, SC(A)s, STs, MBCs/DCs, BCs, BCMs and DWs of all castes candidates should be or over 18 years but no more than 30 years as on. The age of the candidates belonging to general category must be at between 18-40 years. It means that the SCs, SC(A)s, STs, MBCs/DCs, BCs, BCMs and DWs of all castes candidates will be given an age relaxation of 10 years. The contestants must have passed the Matriculation examination/ Graduation Degree, or they should have passed S.S.L.C Public Examination or its equal from a recognized Board. The candidates will be required to pay the One-Time Registration fee i.e. Rs.50/- and Rs.75/- will be paid by them as the examination fee. The bank or Post Office charges will also be applicable. No other way (except online) will be accepted. The applicants have to use the online mode only. For the selection process of the qualifying contenders, the marks scored in written exam and rules of reservation of appointments will be the base. The aspirants, after being selected, will get an attractive pay scale of Rs. 5,200 – 20,200/+ Grade Pay Rs. 2,400/- (Pay Band 1) as per various posts. The candidates need to download the Official Notification firstly from the link given beneath. After that, they have to fill the application form very carefully after clicking on the “Apply Now” link. Upload the relevant document like passport size photos and other required stuff. When done, submit the application finally. In the end, download the submitted application for the future reference. 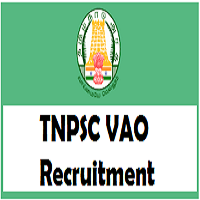 The Tamil Nadu Public Service dispatched the online TNPSC VAO Notification 2019 for the desirable students. More details about Village Administrative Officer Vacancy Exam Syllabus, Hall Ticket etc. then please verify it from here now onwards. This is a great chance for the aspirants who are looking Village Administrative Officer Vacancy. Therefore make use of this notice and fill the online application form before the closing date.